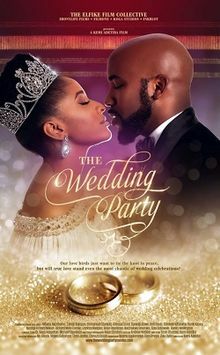 The Wedding Party is the perfect Nollywood Romantic-Comedy that follows the wedding day of two lovebirds Dunni Coker, an Art Gallery owner and Dozie Onwuka, an IT Entrepreneur. The couple took a vow of chastity however this soon causes doubt in Dunni’s mind as she questions the fidelity of her soon to be husband. Multiple shenanigans ensue on the day from matchmaking attempts on the bridal train, a perfectionist wedding planner on a mission to produce the best weeding of her career, the behavior of some ‘village’ guests who gate-crash the wedding and a vengeful ex-girlfriend on a mission of destruction and the worst of all a monster-in-law. The film is a colorful spectacle filled with tense gut-wrenching moments to to scenes of pure comedy. Despite the beautiful venue, assortment of delicious food and top music hits, the piece de resistance is the withstanding love between Dunni and Dozie. Atayero, Issac. "Movie Review : The Wedding Party – The Art Of Ade." The Art Of Ade. December 31, 2016. http://theartofade.com/movie-review-the-wedding-party/. Gboneme, Sandra. "The Wedding Party, Nigerian Movie, Nollywood, 2016." ReviewNaija. March 13, 2017. https://www.reviewnaija.com/reviews/the-wedding-party-movie-review/. Small, Courtney. "TIFF 2016: The Wedding Party." Cinema Axis. September 22, 2016. https://cinemaaxis.com/2016/09/19/tiff-2016-the-wedding-party/.